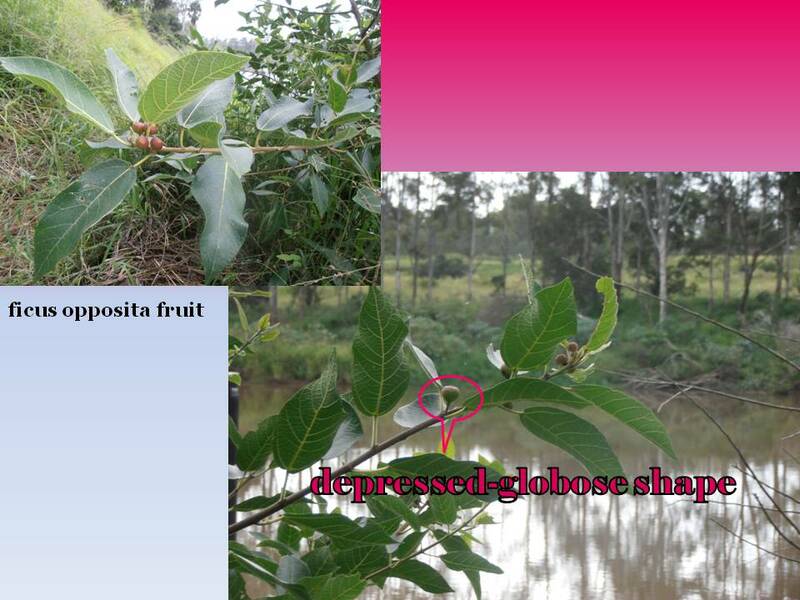 Graeme Wilson (the Editor of the Moggill Creek Catchment Group’s Newsletter and responsible for the group’s Gold Creek Nursery) provided the impetus for assembling this webpage. He has been instrumental in passing on his love 0f native figs. 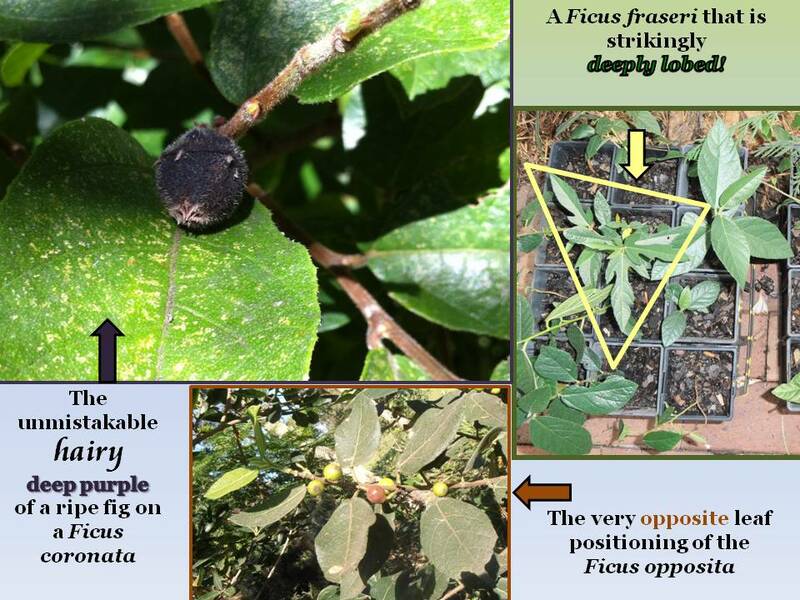 Figs thrive in their natural environment on our property and their beauty is a never-ending source of delight. 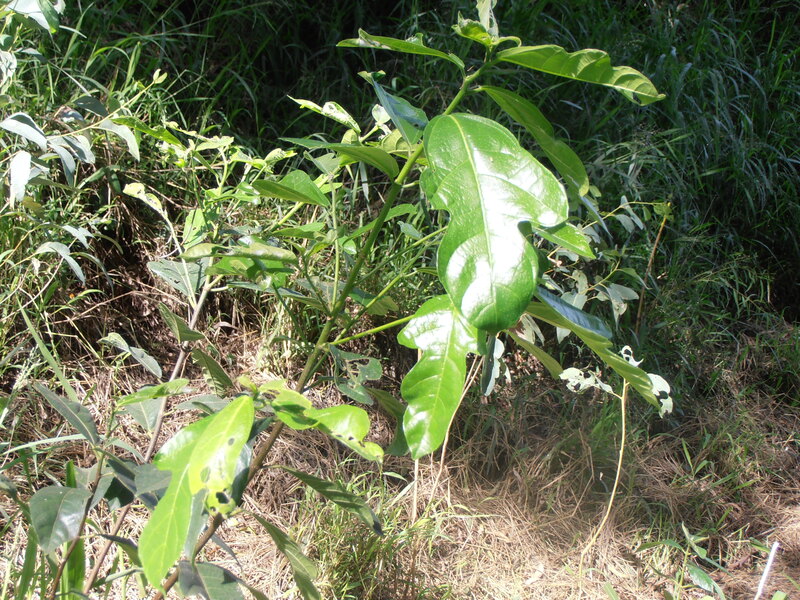 Fig trees also play a significant part in sustaining the wildlife at our place. 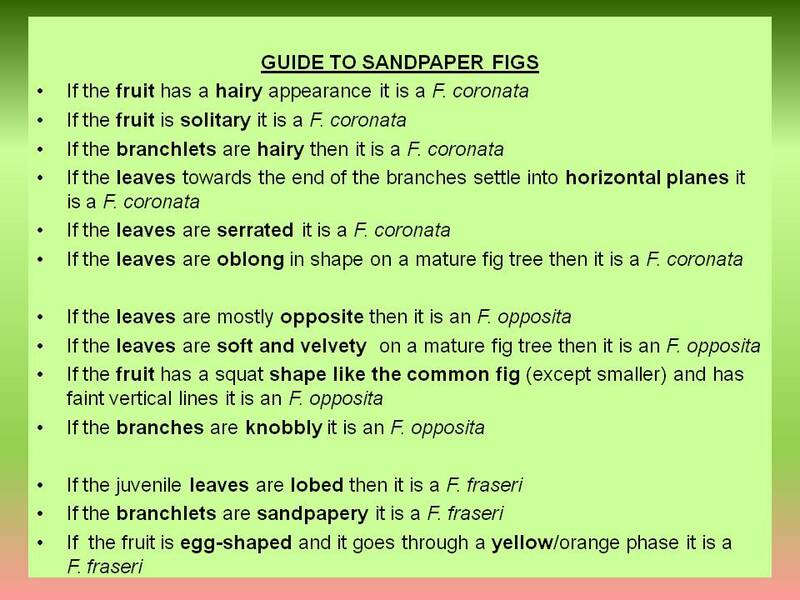 The following summary of the different characteristics of the sandpaper figs is only intended to be a guide to NOVICES who are trying to label the sandpaper figs that occur in their own gardens. We can still find it difficult to distinguish between the sandpaper figs especially when they are young or their fruit is not in season. 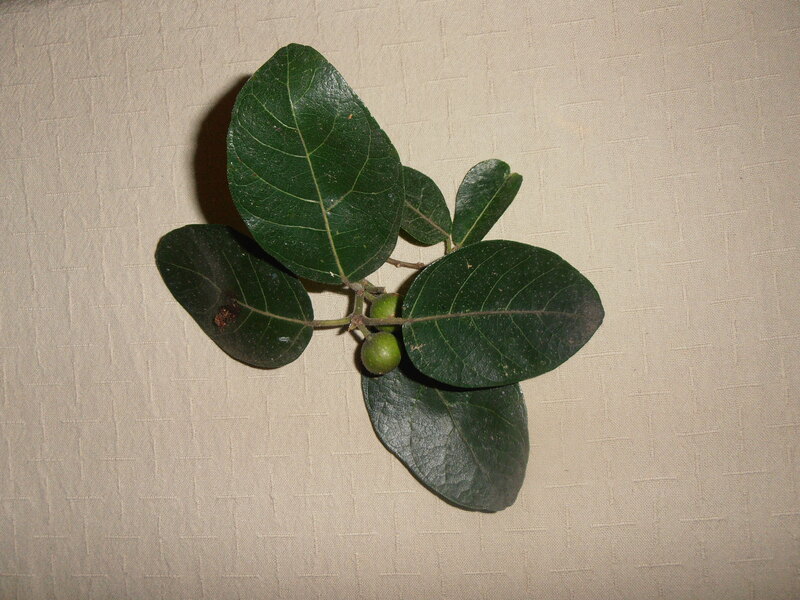 The fruit occurs on Ficus coronata from January to June, but on Ficus fraseri from June to November. 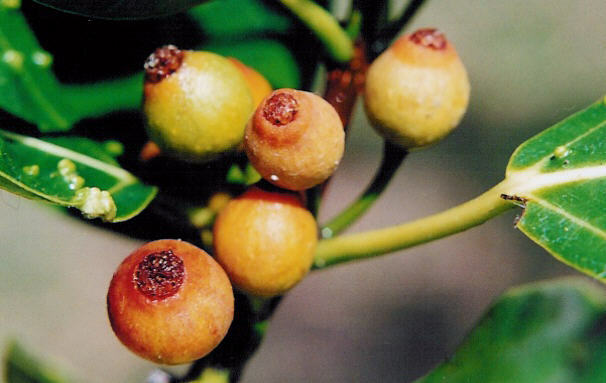 There can be fruit on the Ficus opposita most of the year.There can also be differences in the shape, size and texture of leaves from the same plant. Our advice if you are still unable to identify is to WAIT until the plant is older or it is a different season. 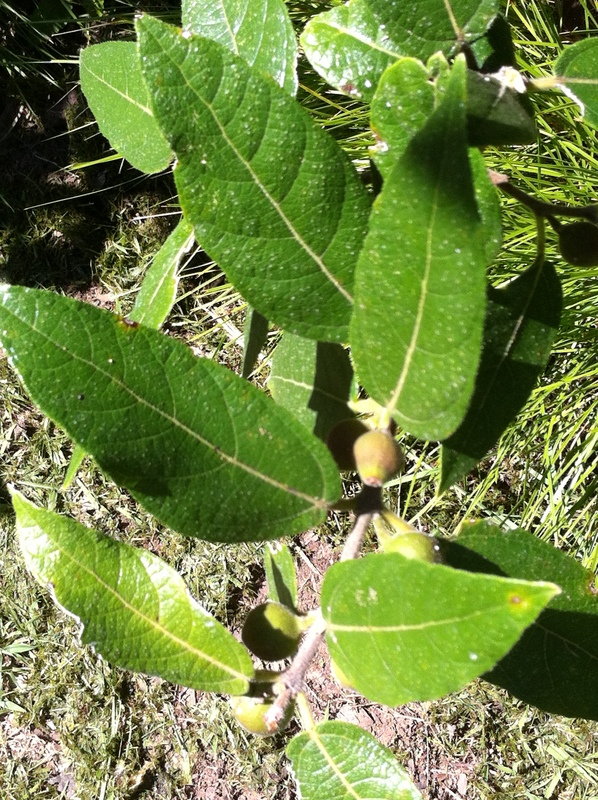 … but we needed extra information to identify the sandpaper figs at our place. 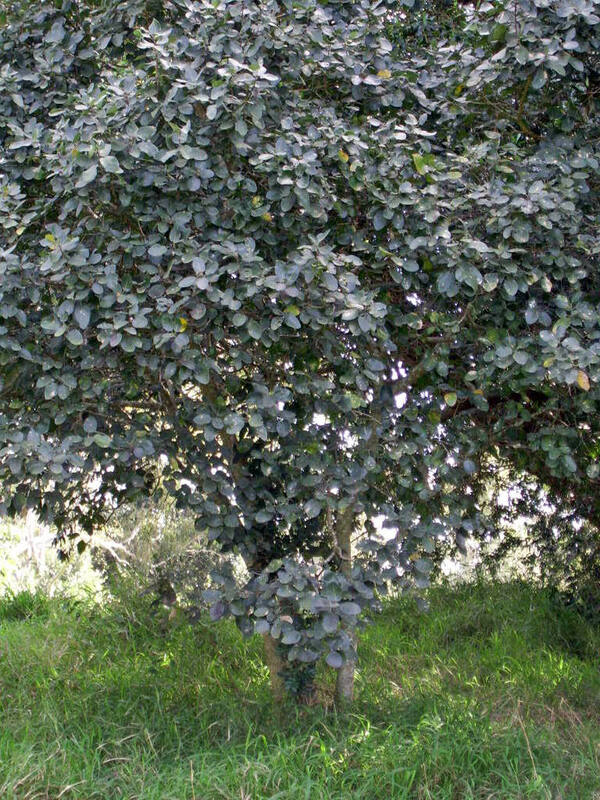 In keeping with this tendency – for the Ficus coronata leaves to fan out in a horizontal plane at the end of their branches – it is usual for the leaves to be asymmetric at the base. 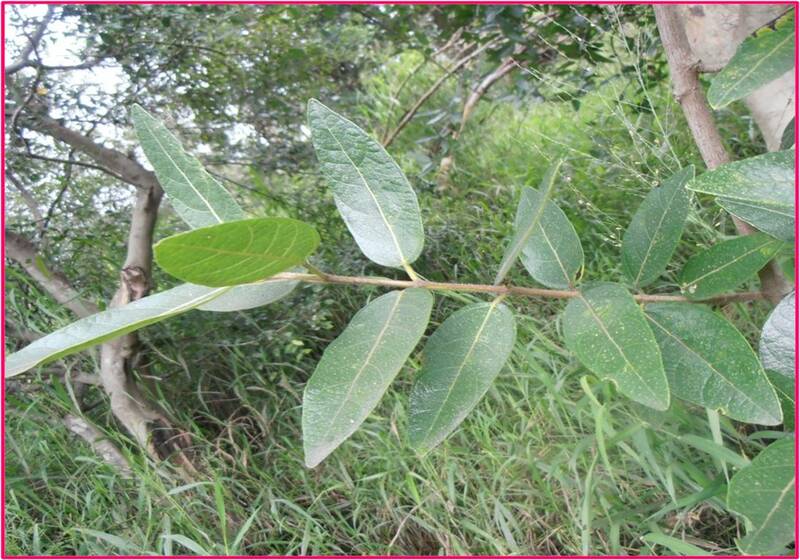 As can be seen in the above photo, the side of the leaf next to the branch is smaller than the opposite side. 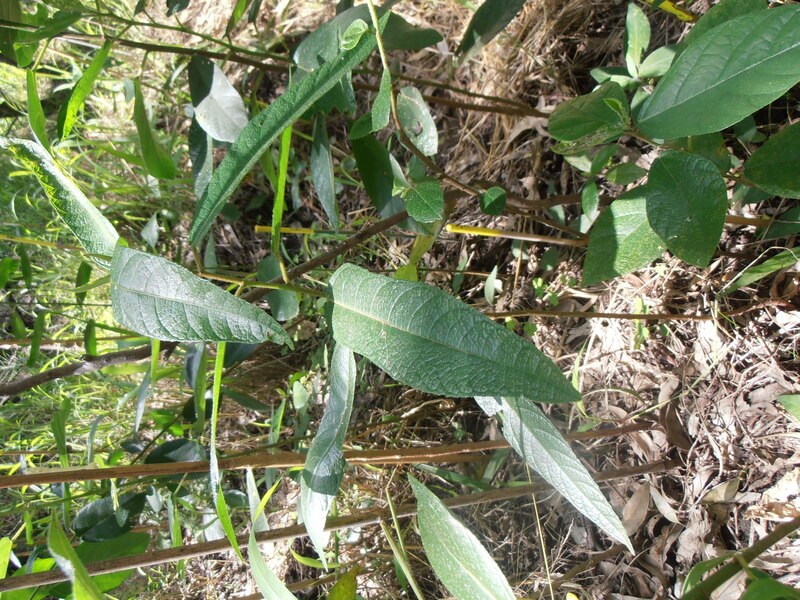 The leaves are not serrated and they are very long but they are not lobed (not F. coronata but unlike many F. fraseri). 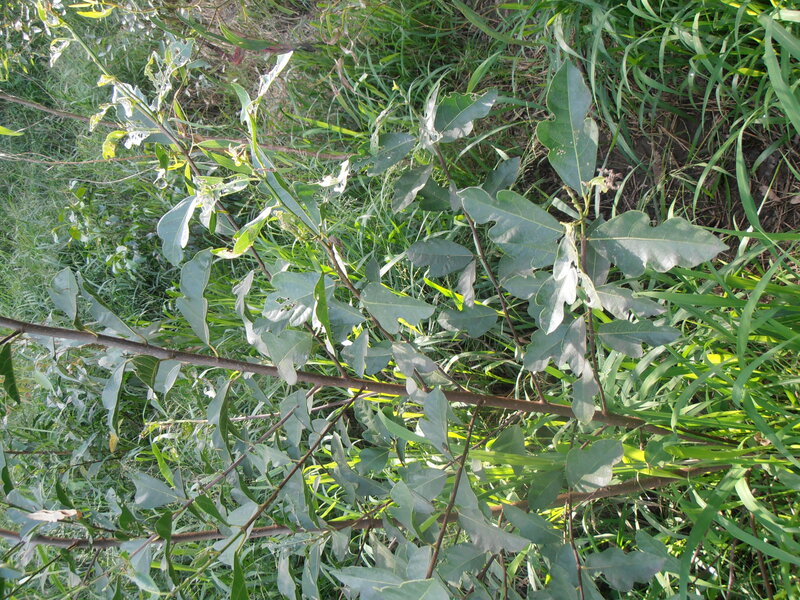 The leaves do not feel very sandpapery (so more likely to be F. fraseri or possibly F. opposita). 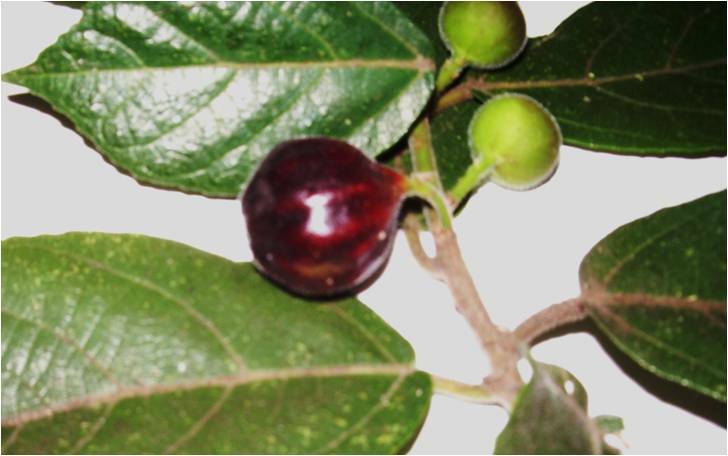 There is no fruit which probably indicates that the plant is too young to bear fruit – but it also is in keeping with a F. fraseri which would not have fruit in February. However it stands in the midst of a group of new F. oppositas (suggesting it is also an F. opposita) which have self-generated along a water course (which is also a feature of F. coronata). 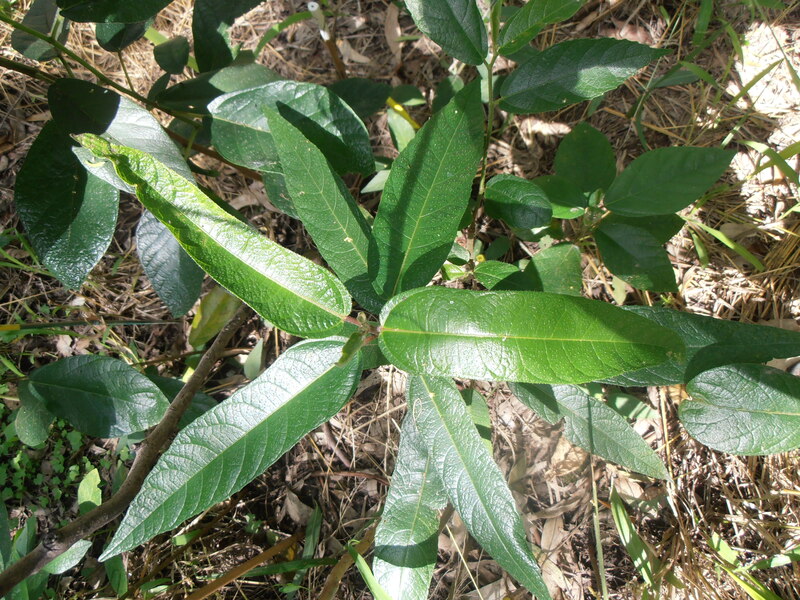 The leaves are partly opposite and partly alternate. So which sandpaper fig is it ? We will have to wait and see! The following is a summary that can be printed into a useful guide for walking through your own garden. It begins with the most obvious steps for identification. Please note that it may not be enough to use only one feature (e.g. 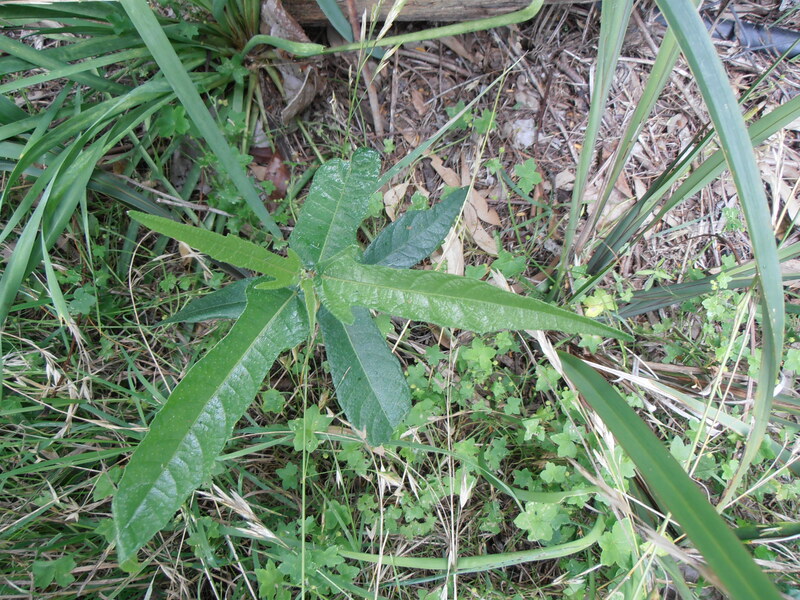 the edge of the leaf) to positively identify a plant. 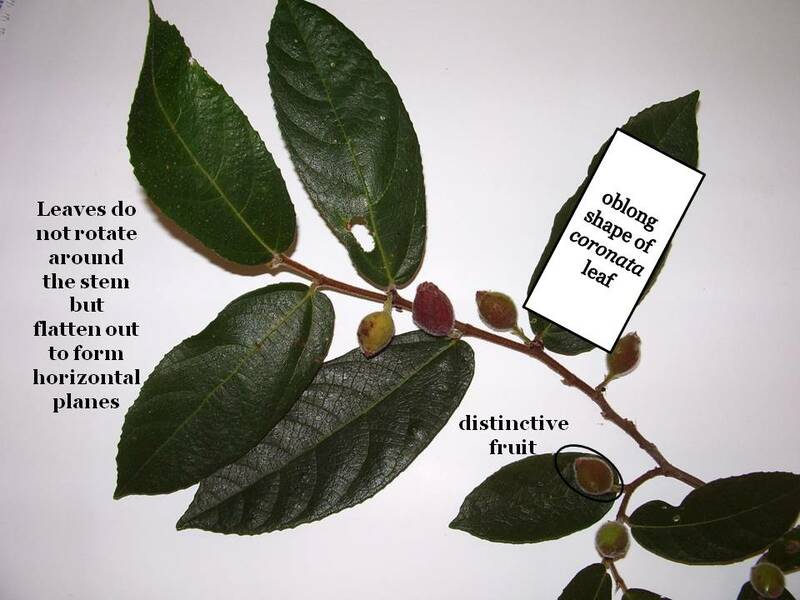 For instance the experts Williams, Harden & McDonald in Trees and Shrubs in Rainforest of New South Wales and southern Queensland 1984, on page 101, point out that the margins of F. coronatas may be ‘entire, toothed or crenulate’ and that the margins on the leaves of F. fraseri are ‘entire or shallowly-toothed’ and on the F. opposita they are ‘entire to toothed or often sinuate(wavy)’. Take your pick! 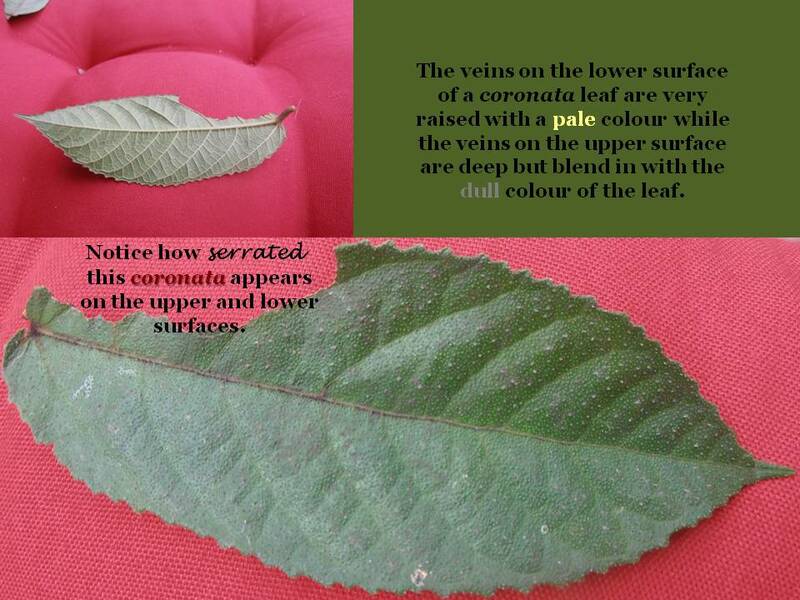 but at our place we inevitably find that F. coronatas have serrations as Graeme Wilson claims! 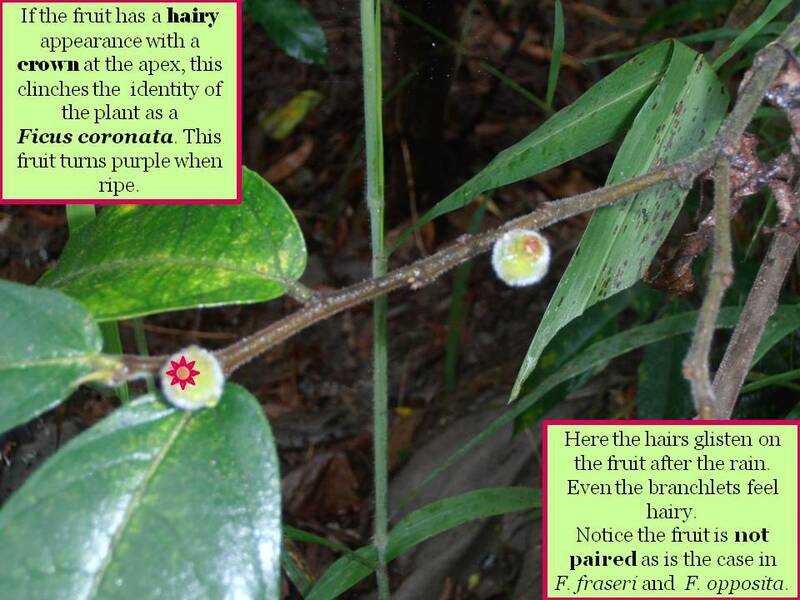 I also found several articles when checking the net that said there is a difference between male and female fruit on the same species and this seems to be the case on my property where they grow wild. I have trees growing next to each other that appear to be the same tree but one tree bears very ordinary tasting fruit and one bears really yummy sweet fruit. I have always assumed that the yummy tree is the female and the other a male. I believed they were both coronata but maybe I have two species side by side.